The end zone refers to the scoring area on the field, according to gridiron-based codes of football. It is the area between the end line and goal line bounded by the sidelines. There are two end zones, each being on an opposite side of the field. It is bordered on all sides by a white line indicating its beginning and end points, with orange, square pylons placed at each of the four corners as a visual aid. Canadian rule books use the terms goal area and dead line instead of end zone and end line respectively, but the latter terms are the more common in colloquial Canadian English. Unlike sports like association football and ice hockey which require the puck or ball to pass completely over the goal line to count as a score, both Canadian and American football merely need the nose of the ball to break the vertical plane of the outer edge of the goal line. A similar concept exists in both rugby football codes, where it is known as the in-goal area. The difference between rugby and gridiron-based codes is that in rugby, the ball must be touched to the ground in the in-goal area to count as a try (the rugby equivalent of a touchdown), whereas in the gridiron-based games, simply possessing the ball while it is in the end zone is sufficient to count it as a touchdown. The end zone in American football is 10 yards long by 53 1⁄3 yards (160 feet) wide. Each corner is marked with a pylon. A full-sized end zone in Canadian football is 20 yards long by 65 yards wide. Prior to the 1980s, the Canadian end zone was 25 yards long. The first stadium to use the 20 yard long end zone was B.C. Place in Vancouver, which was completed in 1983. The floor of B.C. Place was (and is) too short to accommodate a field 160 yards in length. The shorter end zone proved popular enough that the CFL adopted it league-wide in 1986. At BMO Field, home to the Toronto Argonauts, the end zones are only 18 yards. In Canadian football stadiums that also feature a running track, it is usually necessary to truncate the back corners of the end zones, since a rectangular field 150 yards long and 65 yards wide will not fit completely inside an oval-shaped running track. Such truncations are marked as straight diagonal lines, resulting in an end zone with six corners and six pylons. As of 2016, Montreal's Percival Molson Stadium is the only CFL stadium that have the rounded-off style end zones. 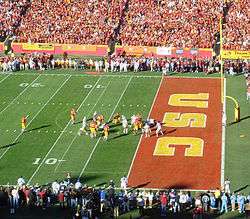 Most professional and collegiate teams have their logo, team name, or both painted on the surface of the end zone, with team colors filling the background. Many championship and bowl games at college and professional level are commemorated by the names of the opposing teams each being painted in one of the opposite end zones. In the CFL and Arena leagues, along with bowl games, local, national, or bowl game sponsors may also have their logos placed in the end zone. One of the quirks of the American Football League was its use of unusual patterns such as argyle in its end zones, a tradition revived in 2009 by the Denver Broncos, itself a former AFL team. The XFL standardized its playing fields so that all eight of its teams had uniform fields with the XFL logo in each end zone and no team identification. ↑ "NFL Rules Digest: Field". Nfl.com. Retrieved 2012-11-23. ↑ "WFDF Rules of Ultimate 2013 – Introduction". wfdf.org. 2013. Retrieved 2 March 2014. ↑ "FAQ about Game Rules and Regulations on CFLdb". cfldb.ca. ↑ "Playing Field". wfdf.org. 2013. Retrieved 2 March 2014.